Samantha Anderson calls Southeast Missouri her home – but that wasn’t always the case. Samantha and her husband, who also works at Doe Run, are Tennessee natives who moved to Missouri for their careers. They were quickly welcomed by their community, and enjoyed how the region’s outdoor activity opportunities made it a great place to raise a family. Helping Doe Run protect this region’s natural beauty drives Samantha at her job as an environmental manager in the Southeast Missouri Mining and Milling Division (SEMO). 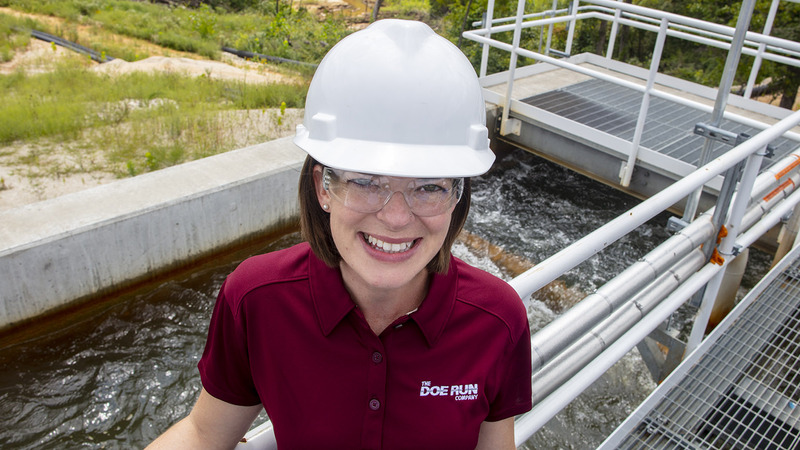 Samantha played a critical role in Doe Run’s water management program, which includes the construction of five high-tech water treatment facilities at its mines and mills over the past five years. Doe Run completed the final plant in 2017. 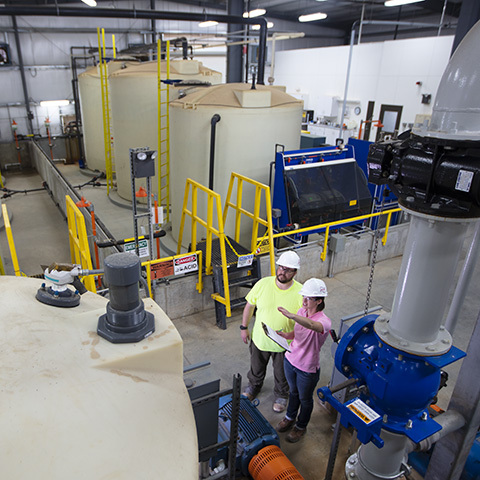 Doe Run’s water treatment plants like the one shown here, treat mine and mill water to meet water permit limits. Doe Run invested nearly $73 million in the water treatment plants. Samantha and the environmental team worked with Woodard & Curran to design and operate each plant – a project that earned Woodard & Curran an Engineering Excellence Award from the Missouri chapter of the American Council of Engineering Companies. The five plants process approximately 35 million gallons of water a day. A chemical process improves water quality to better than permit levels before the water is released into waterways. The newest plant at West Fork Mine can process approximately 18,000 gallons of water per minute, almost twice the capacity of the other plants. The plant manages daily water output from West Fork Mine and Fletcher Mine and Mill, with the ability to handle much more, even during a heavy rain season. Read more about our water treatment process. Over the next few years, Samantha and the environmental management team will analyze the performance of the water treatment plants and find potential opportunities for further improvement. The team will also oversee plans to build a larger retention pond at Brushy Creek Mine and Mill. This larger pond will have greater capacity to hold the surplus mill water, as well as rain that falls on the site. The larger pond may also allow for additional settling time for the water before it is treated in the plant.